Martinis’ self-published first edition has been re-dressed and upgraded with color pages, glossy paper stock of exceptional quality, a Hong Kong printer, 34 more pages, text revisions and a $5 heavier price tag. Evergreen Pacific Publishing, the venerable Mukilteo publisher now owns the copyright, and has retained the convenient wire spiral binding that allows the magazine-size book to open and lie flat, a nice feature when studying the 67 charts and maps which are central to the content. Martinis’ personal expertise in the Everett area is expanded on with significant and insightful Puget Sound contributions from Everett Herald outdoor writer Wayne Kruse, Neah Bay information from Tom Young of Tommycod Charters, Seattle-area guide Gary Krein of All Star Charters, and south sound expert John Keizer of Puget Sound Salmon Charters. Crab and shrimp authority and author of Shellfish Guide J. D. Wade adds how-to where-to instruction for north Puget Sound recreational crab and shrimp locations. The new version has been enlarged, now includes GPS reference points, illustrated step-by-step riggings for mooching, trolling, jigging, knot tying and salmon ID. The where-to, how-to fishing information, while much the same in content, is better organized and designed for quick reference. Major fishing areas, in fact, include a side bar labeled, “Quick Reference” that provides listings of applicable charts, nearby boat-fish facilities, recommended tackle, rigs and lures, expert tips, and local charters or guides. The local guide is organized into six chapters that cover 35 salmon areas, 2 steelhead beach fisheries, 7 halibut spots, 6 rockfish and lingcod holes and 10 crab and shrimp possibilities. 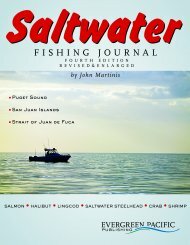 Fishing entries include reasonably detailed maps of the fishing zones with major depth contours, top fishing spots, landmarks, a calendar of poor to good fishing periods, recommended fishing techniques, tactics and tips and advice from local experts. The book will be most valuable to anglers fishing north of Vashon Island. Central and north Sound salmon, rockfish and halibut spots are extensively covered but the south sound is a cherry picking of the hottest hot spots—Des Moines shoreline south from Three Tree Pt. to Commencement Bay, Pt. Defiance and Johnson Pt. Fishing entries for the entire Strait of Juan de Fuca are limited to Sekiu and Neah Bay. Wayne Kruse did a yeoman’s job of researching and detailing the South Sound salmon areas that are featured, but I would have liked to have seen more areas covered in the important fishing areas south of Vashon Island and west of Port Townsend. It is, however, difficult and perhaps unfair to fault a book for what it doesn’t have and in that vein I appreciate what it does offer and will recommend it on that basis. 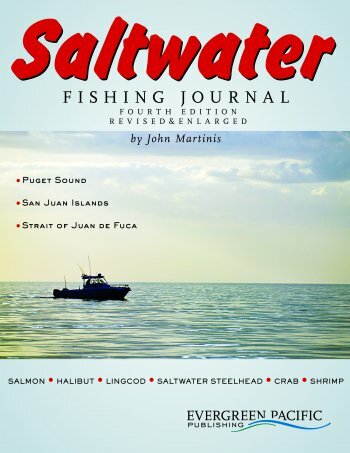 With its sturdy paper stock, convenient binding and tough cover this book can be packed onboard for on-the-water references, and I can’t imagine a salt water fisherman in Pugetropolis who won’t appreciate seeing a copy in the ol Christmas stocking.